The mumps titer checks the mumps antibody blood level for immunity. What is a mumps titer? A mumps titer measures mumps IgG blood antibody levels. Why is a mumps titer test important? This mumps blood test is important because it checks for mumps immunity, usually from prior vaccination. This Mumps Titer is a blood test. The mumps titer, also known as the mumps blood test, mumps IgG titer test, and mumps antibody titer, measures the mumps IgG antibody blood levels. Mumps is caused by the mumps virus. Mumps is very contagious and spreads through contact with the droplets of someone who is infected with the mumps. Symptoms of the mumps include generalized flu symptoms such as fever, muscle aches and fatigue. Classically, mumps also results in pain and swelling of the salivary (parotid) glands approximately two weeks after the exposure. The mumps titer test is a way to prove immunity to the mumps without getting revaccinated. This mumps blood test is frequently ordered by healthcare students and workers looking to prove immunity to mumps for compliance reasons. Some people also order the mumps antibody lab test for personal reasons when concerned about possible exposure to the mumps virus. The mumps titer is a relatively straightforward blood test and can be performed by most Quest Diagnostics lab locations. To get a mumps blood test near you, simply order online and get your blood drawn at the lab you selected. Mumps test results are relatively quick and your mumps lab report will be available for electronic download when available. This mumps blood test reports results as a quantitative, or numerical, IgG antibody level. Quantitative mumps testing is the gold standard for proving mumps immunity via blood testing. Unless a mumps infection is present, positive mumps titer results mean that one is considered immune to mumps according to international standards. 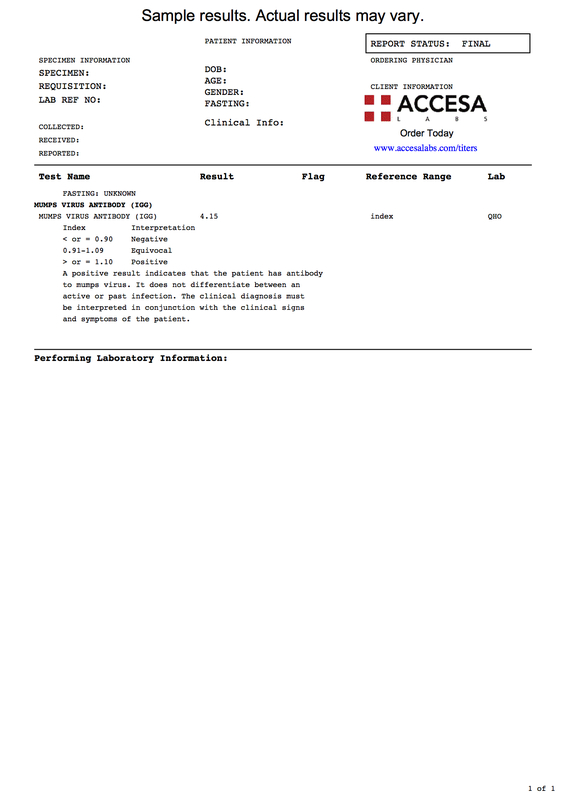 For compliance testing, this mumps titer is frequently ordered with the measles titer and the rubella titer, all of which are part of the MMR titer. Additional titer tests that are typically ordered with the mumps titer include the hepatitis B titer and the varicella titer. We hope you found this mumps lab test report review helpful. Mumps Titer at Guaranteed Prices.